IT’s A GiRL! Producer Amy wanted to capture her second pregnany with professional photos and some maternity body art, so she let me go to town on her. Here she is in her home garden in-between takes taking a breather. She’s a trooper…it was basically an all-day shoot, scorching hot weather and she was approximately 8 months pregnant here. 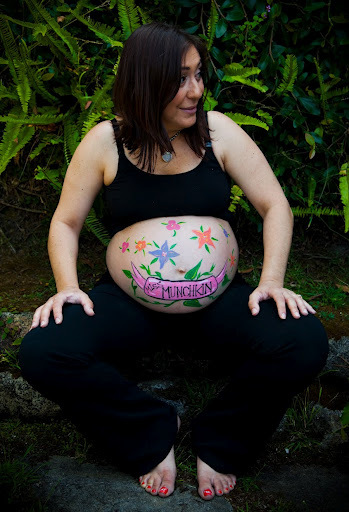 It’s always such a cool experience for me as an artist to do maternity paintings. It’s takes quite some time to finish the belly portion and I can always feel the baby moving around and reacting to the (light) pressure of my brushes. Amy’s baby was relatively mellow, so a special thank you to Miss Munchkin for “holding still” for me.